AvoSeedo is a small plastic bowl that features an indentation with a hole in it. A single avocado seed can be inserted with the flat end facing down. Afterwards; AvoSeedo can be placed in a sufficiently large; water-filled pot. 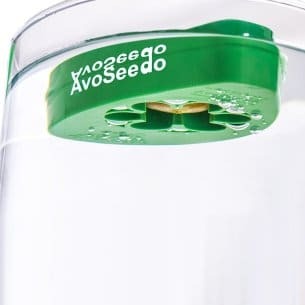 Due to its low weight and high displacement; AvoSeedo will remain at the surface all the time; as the water level lowers; AvoSeedo will sink accordingly. 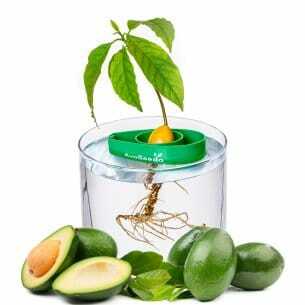 With AvoSeedo; you can significantly raise the success rate when it comes to avocado germination. Without any risk; you can decrease the watering intervals drastically. 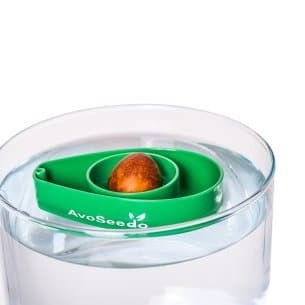 Only from time to time you will have to check the water level of the pot containing AvoSeedo plus avocado seed. Compared to the original toothpick method; there's another advantage: the avocado seed doesn't need to be perforated; reducing the risk of damage (and thus; failed germination efforts). And finally; AvoSeedo features a mounting that can be used to attach small flags. These can be inscribed with the date when germination started; with strain names or with additional information. Thus; you can easily keep track; even when germinating several avocado seeds at the same time.